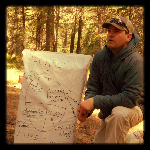 Place Based Education – Selkirk Outdoor Leadership & Education (SOLE), Inc. In the third interview of our Sole-Ful Seven Series, we have Sadie Green, the Secretary of SOLE and a seasoned board member. She is a social worker who moved to the area from West Virginia a few years ago, and lives with her boyfriend and dog Ruuko. SG: Basically, I have been around SOLE for a couple years. I went to a lot of the events, and I believe in what they do. They are good at what they do and that made me want to be a part of it. I’ve worked in some programs where I implemented outdoor activities and it has always been in my mentality, being involved outside. SG: Definitely all of the outdoor activities that are so readily available in all of the seasons. There is not a time when there is not something to do outside. SG: I did a week long horseback camping trip in Wyoming just outside of Yellowstone. It was fun having the horses and riding. Where my we camped (my Mom and two sisters) it was in this high meadow at like 6000 feet way up in the mountains. It was just barely over a mountain from Yellowstone. It was so peaceful. There was a stream running right through it. It was warm during the day and cooler at night, which made it perfect to warm up next to a fire. It was just fun, my sisters and I started quoting all of the cowboy movies we had seen, and tried to guess which movie the quote was from. It was fun campfire stuff like that which made the trip. SG: Mostly I like hiking. Just being places, seeing new things, and seeing cool stuff. I also ski, canoe and swim. Just at water, by water, anything at the lake or something that I can bring my dog Ruuko to. SG: Every year, I am just really excited to see the impact that SOLE has on the community, and each year it just seems to be greater than the year before. I also like to hear people talking about SOLE who don’t know that I am involved; it’s cool to hear the impact it has. SG: The Backcountry Film Festival is really fun. But another experience is when we first moved here, my boyfriend hurt his knee. This was when I first met Dennison, and I was so bummed because I didn’t have anybody to go with me (in the outdoors), so I did a LNT (Leave no Trace) hike to Harrison Lake and that was really fun. It was just a group of people going out, and I didn’t know anybody. Dennison made it a really good hike. That really showed me that SOLE really knows what they are doing. SG: I love all their beer, and I just bought a Black Butte Porter. It is the perfect time of year for that beer. Get to know Sadie and the other board members at our Sole-ful Meet & Greet: A Pre-Backcountry Film Festival Event. It will be a great opportunity to see what SOLE has lined up for the winter, a chance at a sneak peak into the phenomenal silent auction and raffle prizes, as well as enjoy some tasty brews from Deschutes Brewery. See you there! In the continuation of the SOLE-full Seven Blog Series, we have Kevin Knepper, another newer board member who wants to make a difference in this community. He works with several organizations, and lives on a ranch outside of Sandpoint with his family and a large amount of rescue animals. KK: Joy and I have a relationship through the school district. She sits on my board (with another organization), and she has been talking about it for a while. I have a passion for anything kid related. KK: It’s really a wonderful place to raise our kids. That is why we came here. I like the small town vibe. There is a lot that comes with that but we could talk about that for hours. KK: We are a big horse family. I ride a lot and ski all winter long, but the greatest and hardest thing I have ever done was hiking the Grand Canyon 4 days in and 4 days out with 2 other guys. I don’t do men’s trips, my free time is what my wife wants to do and she kind of forced me to go. She said it would be good. I spent 8 days and had no contact with my family. It was physically hard and emotionally difficult. There was a lot of self-examination and it really helped me find out what was important to me and what I want to do better. I also ended up buying a chair for future trips because there was nowhere to sit for 8 days. It’s a tiny little chair that I can carry from REI. KK: Riding horses in the summer and skiing in the winter. We have a lot of horses. I like to just take off and trail blaze. Horse doesn’t need a trail. We just head up a mountain and the horse will take you. Although, sometimes you find yourself on the edge of a cliff. I am a hobby rancher. We have about 30 animals, all rescues except for the horses. Basically we get all the stuff that no body wants and they come to our house. KK: I would like to see it (SOLE) take off a little bit, so it is ultimately sustainable, providing services for kids and adults. A year from now I would like us to be healthier, whether that is larger, or more operating reserves, just healthy, successful and sustainable. It’s fun to do something that is your heart not your badge. KK: Three of my daughters have been to SnowSchool when they were in fifth grade. If they are on the mountain they will mention it, they still belly slide on the mountain when they get bored on black diamonds when skiing. KK: Mirror Pond Pale Ale. I like a pale ale, not too hoppy.